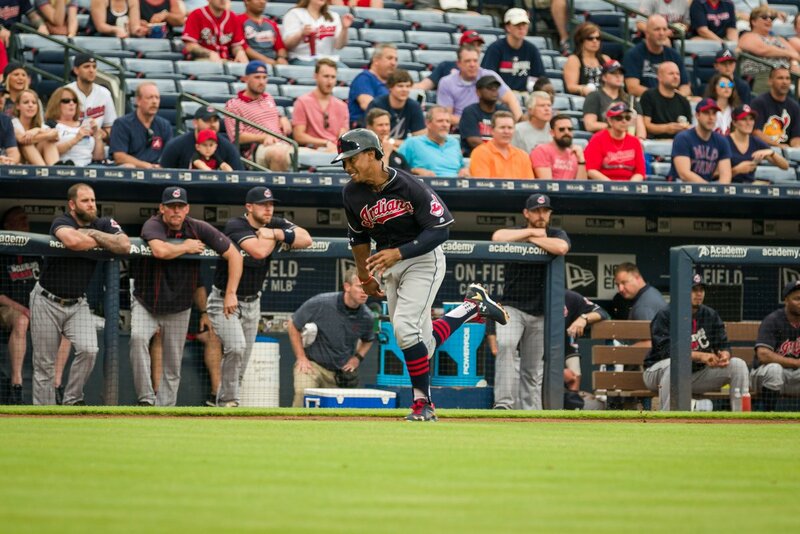 The Tribe took advantage of several blunders by the Atlanta Braves in the top of the ninth inning to pull out a 5-3 win on the road in Atlanta. Cleveland jumped out to a 2-0 lead in the top of the first, giving Corey Kluber a decent cushion to work with. One of those runs came via Francisco Lindor stealing home on a double steal. Kluber pitched five innings without allowing a hit, but the Braves struck in the sixth, tying the game at two apiece. It stayed tied until the top of the ninth, when Arodys Vizcaino and the Braves handed the game over to the Tribe. Vizcaino walked the first two batters and Carlos Santana came through with a clutch go-ahead RBI single to make it 3-2 in favor of Cleveland. Lindor came up with runners at the corners and the struggling reliever threw a wild pitch to advance Santana to second. As if the generosity of the Braves wasn’t enough up to that point, Lindor then grounded to the shortstop Erick Aybar, who had a routine play to try to end the inning, but botched it, allowing Rajai Davis to score from third, and Lindor to reach base safely. Jose Ramirez, who hit clean up on the night, came up and drove in Santana with an RBI single to make it 5-2. It was a rocky ninth inning for closer Cody Allen, who allowed a solo homer and a triple, but went on to earn his 15th save of the season, holding on to the 5-3 win. Kluber is credited with the win, improving to 8-7 on the season with a 3.50 ERA. He struck out seven and walked one, allowing three hits in eight innings of work. Vizcaino falls to 1-3 on the season with a 2.16 ERA. Matt Wisler’s solid effort goes to waste, as he worked six innings, allowing two earned runs, striking out nine. Cleveland improves to 46-30 with the win. The Indians and Braves are back at it on Wednesday at 7:10 PM, as the Tribe looks to extend their win-streak to 12 games. Danny Salazar (9-3, 2.40) will take the mound for the Tribe, the Braves have yet to announce a starter.